Click Here to view Live Data from EREC’s onsite solar demonstration. Due to members’ growing interest in renewable energy sources – particularly solar — EREC has completed construction of an on-site solar demonstration project. The solar array is for informational purposes designed to demonstrate objective and actual data for a typical, residentially-sized solar installation. 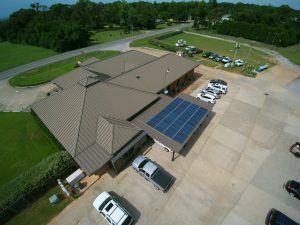 The 40-panel, roof-mount solar array at EREC’s headquarters in Jay, Florida, has a generating capacity of 10.6 kW (at the installed cost of approximately $35,000) and an estimated annual output of 14,600 kWh. This solar installation is sized to demonstrate the output needed to run the average member’s home – minus climate control during seasonal peaks. The solar demonstration project is owned and operated by PowerSouth Energy Cooperative, the generation and transmission facility for EREC. Members are invited to call EREC to schedule a visit to view the solar demonstration to get actual operational data to make an informed decision if they are considering solar panel installation on their property. Electricity supplied from renewable energy sources, such as solar, geothermal, wind, and various forms of biomass, help to reduce CO2 emissions as well as help lower demand on EREC’s power distribution system. These energy sources are considered renewable energy because their fuel sources are continuously replenished. EREC supports the use of member-owned renewable generation for facilities of 25 kW or less. 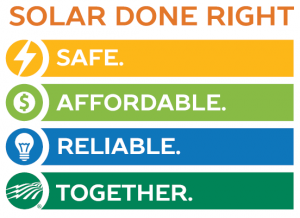 EREC members wishing to interconnect “member-owned renewable generation” to EREC’s electric distribution system are required to complete a Standard Interconnection Agreement and are subject to EREC’s Net Metering Rider. Upon facility approval, EREC will install a digital net meter to record kWh usage and generation. For more information, please call us at (850) 675-4521. Solar Done The Right Way!